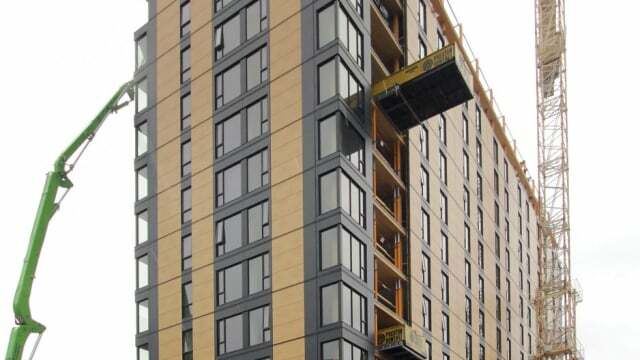 The International Code Council (ICC) will vote this fall on whether it will support a code change allowing the construction of wooden buildings that are 9-20 stories tall, but controversy still swirls around the movement. Mass timber buildings are either wholly or partially made from wooden members over a foot thick. Techniques for creating these members include glue-laminated timber, where several layers of wood are laminated together to form a sturdier whole, and cross-laminated timber, which is the same as glue-laminated timber, but involves the wood layers being laminated together perpendicular to each other, much like layers in a Jenga tower. Advocates of mass timber say that the thickness of the wood protects it against burning in a way that more typical, stick-built construction doesn’t provide. In 2015, the ICC established the Ad Hoc Committee on Tall Wood Buildings (TWB) to study the science and safety of tall mass timber buildings. Since then, the ICC has been developing proposed revisions for the 2021 International Building Code (IBC). This April, the committee approved several tall mass timber code proposals, with three new subcategories of code-approved wooden buildings. Type IV-A buildings must have their wooden elements entirely covered, and can be up to 20 stories tall; Type IV-B buildings must have their wooden elements partially covered, and can be up to 12 stories tall; and Type IV-C buildings can have their wooden elements entirely exposed, but can only be up to nine stories tall. The exact approved height of the building in each case will be determined by a structure’s location, use and number of residents. The committee developed these subcategories through fire testing, including five full-scale fire tests that were performed on a two-level mass timber apartment building. The testing examined how the amount of exposed mass timber impacted the burn and the heat release resulting from a fire. Perhaps not surprising, one of the strongest opponents of the proposal has been the Portland Cement Association, America’s policy and research institution representing cement manufacturers. Earlier this year, the association sponsored an 800-participant online survey on what the public thought of the safety of wood buildings. In the survey,75 percent of participants said they didn’t think it was a good idea to raise the allowable height of wooden buildings, citing the fear that wood wasn’t strong enough (33 percent), that wood buildings could be a fire hazard (31 percent), and that such structures would deteriorate quickly (10 percent). To address these public concerns, as well as those within its own ranks, the TWB released a document this past August that included 16 frequently asked questions about its new codes, along with answers to all of them. The questions addressed topics ranging from fears that the new standards are being implemented without enough technical and research support, concerns about firefighter access, anxiety that the rules surrounding Type IV-B building wood exposure are too complex, and worries that different worldwide fire standards could make these wood building codes less safe in different parts of the world. The TWB answered the concerns with reference to its fire testing, how it planned to cautiously implement its standards, and how its new proposed codes compare with standard code practices. Its full responses are here. As of publication, the ICC is still poised to vote on these recommended code changes at the 2018 Annual Conference and Public Comment Hearings, which is scheduled from October 24 – 31.